In a relationship going bad, we will hold on. And hold on. And hold on. Regardless of how bad it gets. Until one day we just break. Our heart, spirit and then our soul. Letting go is so VERY hard, because, we have been taught throughout life— to hold on. We’ve never been taught to let go or not to hold on!!! Holding to Mom’s hand was the only way of crossing the street until we learned how. Being held as children, we were to hold on to whomever was carrying us. Holding on was the only way of staying safe. It’s been deeply embedded in us as children. In church, there are songs and sermons with admonishments of “Hold On”! Whether that be to God’s unchanging hand, holding on until our ship comes in, or until something good happens. Even in faith, we are taught to hold on to the invisible, until the invisible brings the visible of what we want. So, it makes perfect sense to hold on, all the time, even in a bad relationship. It feels safe, or it is all we know to do. We hold on to the bad, especially the continuing bad (in faith) hoping the necessary and permanent (good) change will happen. But, in many cases, holding on only brings constant unbearable pain and anger. The art of holding on most of us have truly mastered. We need a whole new hustle now. Just as holding on was for our safety, letting go is as equally important! There are consequences for not letting go. We are giving in all the time just to keep the relationship together. Accepting the bad becomes normal. We are holding on, but we do not hold our partner accountable for the bad mistakes he/she continues to make. Before long, we begin to lose self by yielding, giving, pacifying, accepting what we would normally never accept. This continues until we don’t know who we are anymore. Even worst, we lose time. Time slowly slips by. Days become weeks, and months until we find 2-3 years later, the relationship is no better— only worse. How do you let go??! Think about it………….What is holding you there? Trying to save face? Don’t want to be alone? What have you got to lose? Why are you so determine to keep this person? Is this person an asset to you financially, sexually, emotionally, intellectually, and mentally? When answering the questions honestly, you will find it is you. Your very own “holding on” undoing! Not even your partner is holding on as hard as you are! How much more evidence do you need to know that? You must face the facts as they are. KNOW the love you feel is not the same love your partner shares. KNOW the failure is not in you. KNOW your partner’s relational investment is not nearly as high as yours. KNOW your heart is only as strong as your mind. Allow your mind to tell your heart the truth. KNOW if you were to make a list, your partner’s short comings would far outweigh his/her “up-comings”. KNOW there are literally millions of people in the world. The odds of meeting someone better is in your favor! KNOW the value you bring. You can be with anyone, who is on the same level as you— and it will work! Having the courage to let go does not mean the absence of fear. Living with fear is normal. It’s wrong, but it’s normal. The only thing we have to fear, at this point, is choosing to stay. 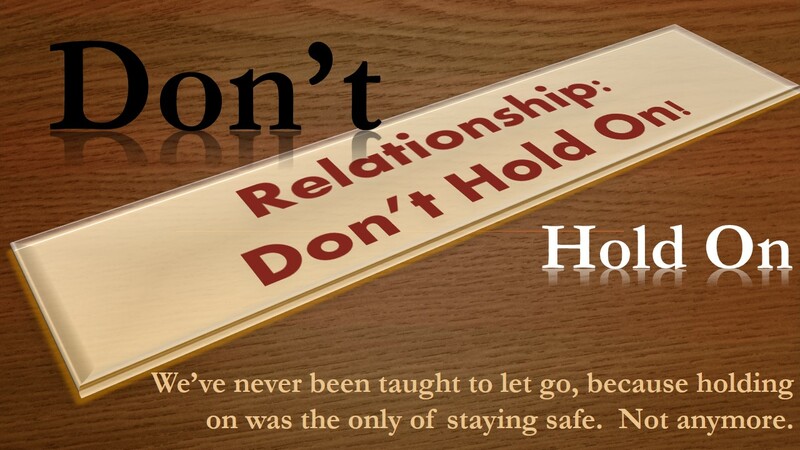 Holding on does not guarantee relational success. It does guarantee we will give more, and our partner will give less. Until we lose who we are. Until we’ve cried the last tear. Until we’ve taken the last heartache pain we can stand.